Since I get questions from time to time about beauty products or makeup, I thought it would be fun to share with you a little about my skin care routine. I guess I should say that having a general skincare routine has been somewhat new for me in the last few years. I was blessed to have relatively good skin during my teenage years, so although I certainly had to coverup pimples and blemishes when they happened (usually on the worst timed days of course), I was a little spoiled to not have to think about my skin that much compared to others. As I’ve gotten older I’ve been much more militant about taking off my makeup at night no matter what (no excuses!) and now I have to fully clean my skin as well before I can give myself the all clear to go to bed. I have a little 1-2-3 system that I do now that only takes a few minutes, but really makes a big difference in how my skin feels. 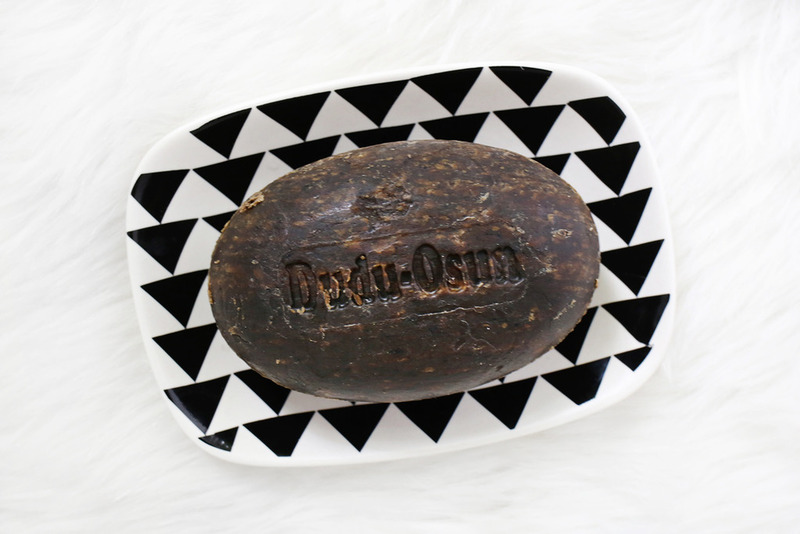 Step One: I wet my face and neck with warm water and use this Dudu-Osun African black soap to work up a small lather all over my skin. I have relatively sensitive skin and was trying to get away from beauty soaps and lotions with harmful additives, so I love that this is made from all natural ingredients and herbs. Step Two: I use a battery powered skin brush to totally clear my skin of all makeup residue and exfoliate any dead skin cells as well. I first was directed to use a skin brush by AnnaRose Kern (a Hollywood makeup artist) when she came to do some beauty posts with us at A Beautiful Mess last summer. She noticed the white bumps all over my forehead, told me it looked like Milia and that my pores were probably clogged. She quickly guessed correctly that I wasn’t cleaning my skin very well at night and suggested a skin brush to remedy the issue. I thought those white bumps were just a normal part of my skin, but it only took a few days of using a brush to notice the bumps decrease and then disappear. YES! I was using the cleanser my brush came with at first, but AnnaRose steered me towards the African soap instead and I was hooked. 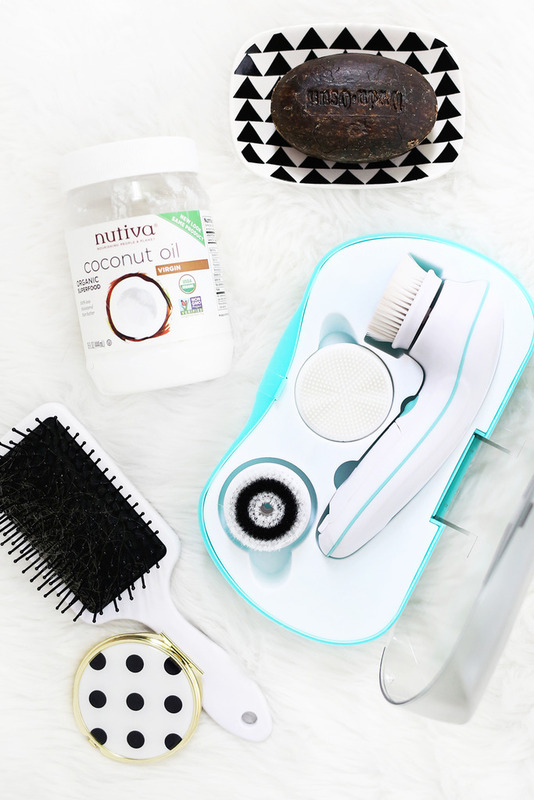 Since I used it so much, I eventually upgraded my skin brush to this Ultimate Skin Care Spa System, and I love it! The first night after using this brush I couldn’t stop touching my face. Even the next day I kept running mu fingers across my cheeks and chin, they were so soft! Lucky for you, you can get the system for 70% off (so only $37.50!) if you use the code GUMMERGAL at checkout (you can also use the code on this skin care system as well). This was a total game changer for my skin and now I’m so addicted. I even took it to Paris with me since I couldn’t go a whole week without it. The best! 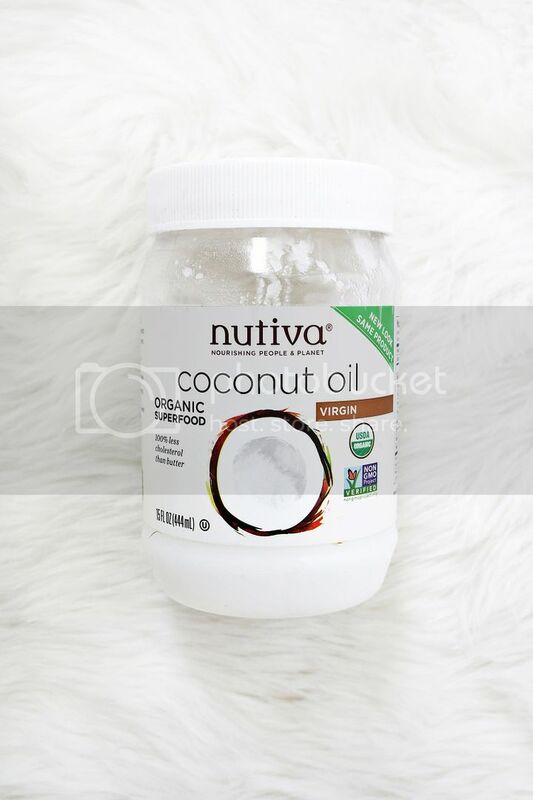 Step Three: Once my skin is totally clean, I use a tiny amount of this organic non-GMO coconut oil on my face as a moisturizer. I’ve always had the worst dry skin on my face and this is actually the best moisturizer I’ve found over the years. It’s also really helpful because the African soap tends to leave my skin a little tight feeling, so this remedies the feeling instantly. One jar lasts forever since you use so little, but mine goes a bit quicker since we also feed some to our cats every night. It’s their favorite thing in the world and it’s supposedly really good for them too. I can’t even go into our bathroom now without Charlie jumping on the counter because she thinks she’s going to get a taste—she loves it! By the way, I also use this to take all my eye makeup off before I wash and use the skin brush on my face. It’s great for mascara and stubborn lipstick colors! Overall, I’m really happy that my skincare routine is so easy but yet leaves my skin feeling so soft (especially since I was prone to such dry and rough skin before). Obviously everyone’s skin is different and there are lots of opinions on what is “good” or “bad” for your skin, but if you don’t already have a routine that you love I would highly recommend giving some of my favorite things a try to see if they work for you. I’ve been pretty happy with how they’ve worked for me! Categories: Home Life | Tags: home life | May 29, 2015 by thebandwifeblog. Thank you for the coupon code! I’ve been waiting to bite the bullet and get one of these! I’m so glad I waited. 1.) The “natural ingredients and herbs” in your soap don’t necessarily make it a smarter choice for sensitive skin. In fact, a lot of natural oils and extracts can cause sensitive skin to react (lavender and citrus oils especially). Also, if it leaves your skin feeling tight, it may not be the best choice anyway. Skin should never feel tight or uncomfortable after cleansing. 2.) Coconut oil is known to clog pores when used as a moisturizer (as opposed to using it as a makeup remover/cleanser, as it’s rinsed off). Were you using this before you started using the brush? It could be the culprit to your milia. 3.) Have you ever tried a chemical exfoliator like an AHA? Facial brushes can actually cause more harm than good if used everyday, as they are quite abrasive, and low-percentage AHAs are more effective at sloughing off dead skin cells. Unsolicited advice, I know, but I had a lot of the same issues you had (sensitive skin, milia, over-exfoliation habits), and my skin made a complete turnaround when I started really paying attention to skincare research. I used a lot of other moisturizers before the coconut oil and I didn’t like how my skin felt. I use the smallest amount of the coconut oil (and dab off any excess) and I’ve been really happy with it and have other friends that love it too. Also, I use the gentle brush on the low setting for my skin everyday, not the exfoliating brush. Tina, I wish there was a “like” button for your comment. Those were my exact thoughts! Love this post! I’m going to have to pick up one of those skin brushes! We feed our dog and cat coconut oil every night too and they go nuts over it! Everyone is always so surprised when I tell them it’s their fave treat 🙂 It’s always worked really well on my skin too. I know!! It’s crazy how much they love it! I have been wanting a skin brush system for years. It’s been on my Christmas list FOREVER! Thank you for the code…just ordered mine! I love the idea of clean skin, mascara and lipstick, that’s it! Oh good! Perfect timing then! I decided to give it a try and ordered. Thanks so much for the code! Oh good! Hope you love it! Did the link and code expire to the brush? Great tips! I too have semi sensitive skin and love to use more natural products. Anything from Lush is my favourite! Is the spin for perfect skin battery operated? Yay! I just use it once at night with the regular brush on the low setting and usually just coconut oil at night (unless I have a dry spot). You just need a little though! i also love coconut oil! have you tried jojoba oil? ive heard its the closest thing to the natural sebum our bodies make. i like to use it on my face and use the coconut oil more on my arms and legs and my hair! it does wonders! the first link doesnt seem to work for me, seems broken…? My husband and I love Dudu!!! (I already laughed. Real mature, I know.) But truly, it’s our favorite soap for the reasons you listed. AND you feel extra clean after you see the color of the water afterwards. 😉 I have been on the hunt for ways to use natural and simplified methods for cleaning and nurturing my face. Thank you for the recommendation — and discount! 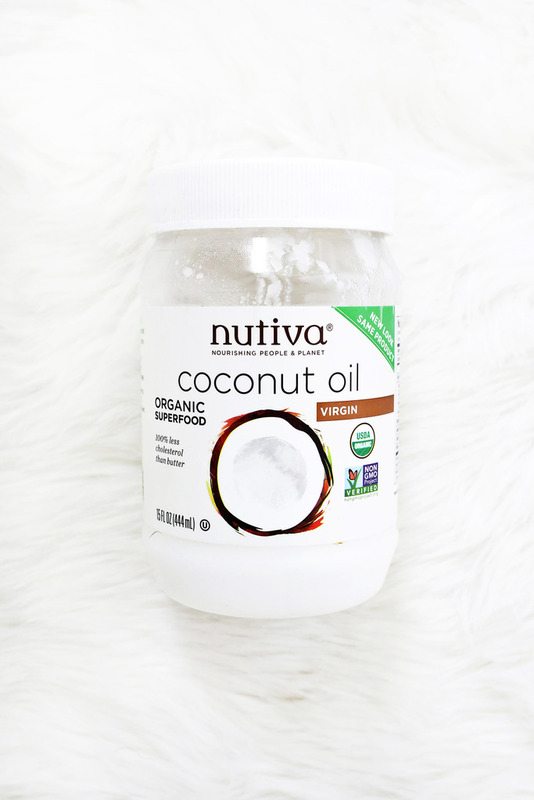 Coconut oil is seriously the best! I like to mix it with either olive or avocado oil and essential oils to make a body/hair balm. What moisturizer do you use during the day under makeup? Coconut oil? Thanks! Thanks for the code! I actually have never had many skin problems (aside from sometimes greasy skin) so I typically just use a mild soap and moisturizer. I’ve never even considered getting a brush, but with that code, I couldn’t pass it up. Thanks again! I can’t wait to try it!!! Do you think this Ultimate Skin Spa is better than the Clarisonic? I currently have a Clarisonic. But, I have the same issue that you used to have! Those little white bumps! I sometimes get facials to have them professionally removed but now refuse to go because my skin is so sensitive I now have tiny little holes/scars on areas of my face! I asked my dermatologist what I should do, but needless to say, she too was not much of a help to me either! 🙁 I read that it could be caused to pores being clogged (like you had mentioned), however, I make the largest effort of buying oil-free/non-comedogenic products. I bought all those “charcoal” products in hopes & beliefs that they’d somehow work a miracle in extracting all the impurities from the day, but no cigar! I’m twenty-five. Does this mean I’m doomed forever? Haha! Please, I’m curious to hear your sincere thoughts! Do I sound desperate? Yeah, maybe a little. I’ve only started getting “millia” or these white bumps a year ago! Very odd and unlike my skin! Oh man, I wish I could help! I haven’t used a Clarisonic so I’m not sure what the differences are in the brush, but if you feel like you are cleaning your skin well and not using products that clog your skin, it could be from another source as well. I would try a new dermatologist if I were you. I’ve found that you’ll get pretty much a different option from every doctor you go to for an issue, so get as many opinions as you can and try each suggestion until one works. Not a quick fix, but that’s what I would do! Hope you find something that works! THANK YOU for the coupon code. I balked at the actual price – so expensive! I can’t wait to try it. I’m about to order this skin system! I have a clarisonic now and it’s good but I feel like I need something more. I’m very excited to try it! Thanks for the coupon! 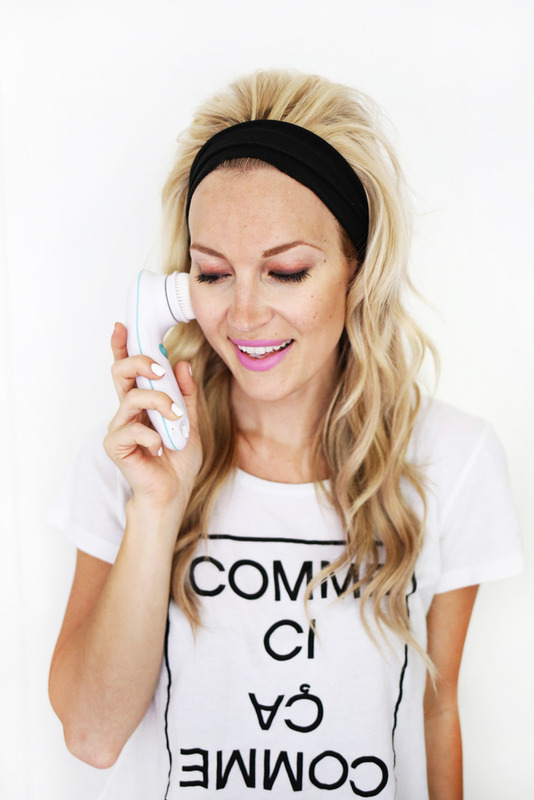 I see its now been a few months – how have you found the brush in comparison to the Clarisonic? 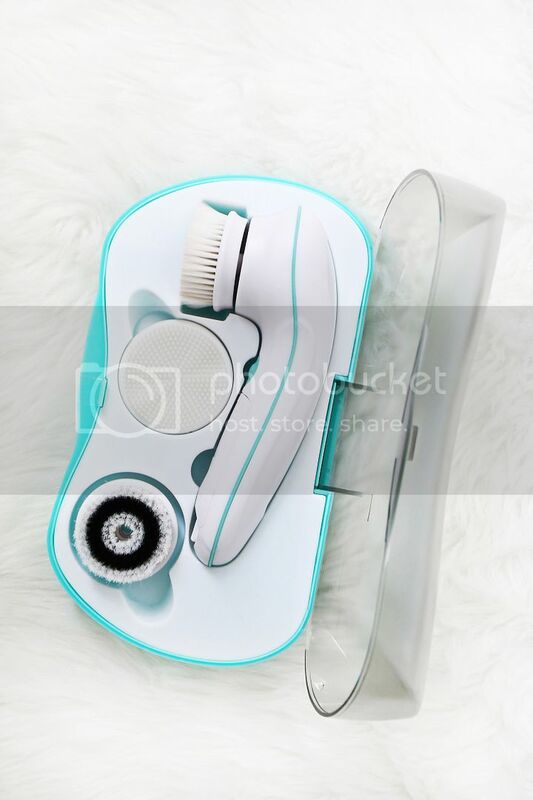 I’ve had my eye on the Clarisonic for a while now and would love to get the Vanity Planet one if it’s just as good – especially for the price difference with the code! I haven’t used a Clarisonic, so I can’t compare, but I really love my brush! Love it! Thanks for sharing. I may haven’t develop a skin care routine. But I guess that the biggest secret for all the skin care is knowing which products is better and what works best to our skin.